The Pandrah Yantra also called as Pandrah Che Yantra or Pandariya Yantra is considered to be one of the most powerful of the Hindu Yantras in the world. The Pandariya Yantra and its variations are worn and worshipped for a wide range of purposes including vashikaran, money, job, enemy problems, love, marriage, wealth, money and astrological purposes. 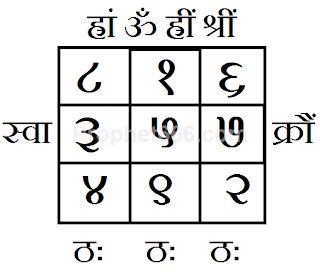 This Pandariya Yantra described by me in this post, which has been shared by Piyush Jaiswal is a variation, which is basically used for Navagraha Shanti. 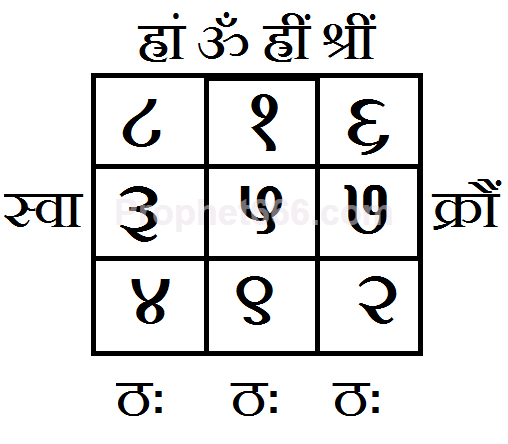 This Pandrah Yantra is a variation with the inclusion of some Beej Mantras. This site has in the past written about the Pandrah Yantra and some of its variations, the Yantra making procedure might vary depending upon its specific use. In my opinion this Pandrah Yantra, which is basically for resolution of planetary ill-effects [Graha Dosha Nivarana] can be prepared on any auspicious Tithi, Shubh Muhurat, Hindu festival or a beneficial Astrological Yoga. It can be prepared on a Bhojpatra with a pointed wooden stick using Ashtagandha, Raktachandana or Sandalwood paste as the ink. Then is should be worshipped by offering it incense and an oil lamp and the inserted inside a Metal Locket and worn around the neck as a talisman for removing bad astrological influences of debilitated planets in the horoscope. It should also be useful in deflecting harmful vibrations of Papi and Marak Grah in the Kundali of the user of this Yantra. I don´t know if its already mentioned or posted somewhere, but can´t find it..
How a yantra is worshiped? any mantra? or just simple prayers for your purpose and lighting incense and oil lamp is enough? If you look in the last peragraph of this post you will find it. How to worship this Yantra. Could you please tell me if I can make Pandrah Yantra on plain paper or not? I could not find the bhojpatra.Please reply it is my humble request. You can use white paper and red ink for making this Yantra. Instead of writing Can we take a red colour printout of the yantras ?? No, the Yantra has to be prepared as explained in the above post.